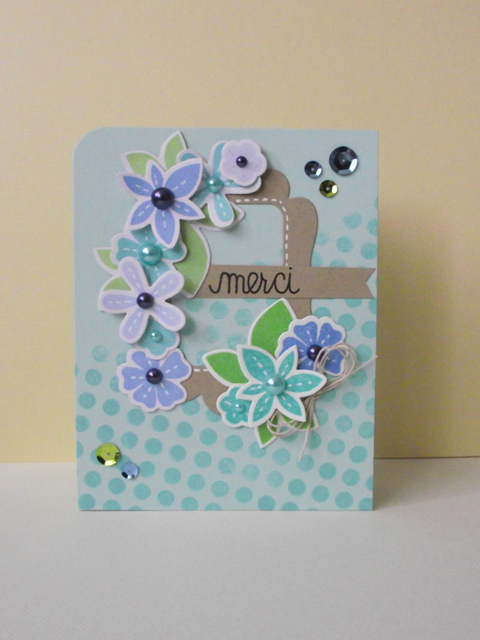 This week was colour challenge week over at Paper Smooches Sparks! I picked-up some new Smooches die cuts the reflections sets and the frame. It will double as a thank you for a dear friend. Paper Smooches stamps and dies, Reflections stamp set and dies, as well as, Duo Die 1, Geo Graphic for the Polka Dots and the sentiment is from Flap Happy. Memories Black, Hero Arts Mid-Tone in Tide Pool, Cornflower, Soft Sky and Green Hills. So, so, so pretty! I love the layered flowers and beautiful sequins! Love how you stamp the dots at an angle for the background, Kim! And the sequins? Swoon! Pretty, pretty colors!